This weekend I read Everything That Remains, which inspired me to jettison piles of our belongings. I don't necessarily recommend the book, which is a memoir of two men who abandoned their corporate, consumerist lifestyle and embraced minimalism, but I found the concept fascinating. Space is a premium in our new house with only two closets for the three, soon to be four, of us. I felt great after our last trip to Goodwill, but reading the book showed me that I can let go of so much more. In the book, the authors talked about how people hold on to items "just in case," when years and year go by without that case ever presenting itself. Guilty. If something is useful, I feel like we should keep it, even if we don't actually use it. When I objectively looked at the situation I saw how silly it was to keep these kinds of "useful" items around. So gone are the chopsticks rolling around in the kitchen, the skirts I haven't worn for years, and the exercise equipment collecting dust. I also identified with the concept of objects representing our identity. We hold on to books because we want people to know that we are well-read, board games because we want to show we are are fun-loving, crafting supplies because we want to feel creative. Sometimes we are trying to tell those stories to other people, but a lot of the time we are telling them to ourselves. Admitting to myself that I am never going to read my religion textbooks from college again and removing them from the shelf felt fantastic. So did donating the empty picture frames that taunted me with my inability to print out photos to place inside. My biggest challenge has been letting go of gifts people have bought for me over the years. I feel intense guilt donating or selling an item someone gave us, even if I never use it. There are a couple of big-ticket items I am still holding onto because I can't get over the fact someone gave it to me, even though I almost never use either one. The gift givers would want me to pass it on to someone who would use it, right? Earlier this week I sorted through my portion of our dresser drawers, went through HP's toys and books, the kitchen drawers, our bookshelf, and am finally finishing sorting through and digitizing our CD collection. Next task: the file cabinet. I am fairly certain I have our electric bills from five years ago neatly filed in a folder. Seems unlikely that I will need those in the future. When a friend and her daughter came over yesterday she said, "Your house looks so clean!" My response: "Clean? You mean that it looks liberated from all of the physical objects that were mentally and emotionally weighing me down? Why yes it does." Okay, I didn't say that. But I thought it. Less stuff. More space. So liberating. As of a couple of weeks ago, I am officially in the third trimester. Seeing as how I have taken no pictures and written no updates for this pregnancy, it's probably about time to share how it's going. In general, this pregnancy feels more relaxed than my first one. I am much less in my head about all the details, which I consider to be a good thing. I am too busy living our life to obsess about exactly how far along I am or reading every pregnancy book, blog, and forum in sight. The whole experience has been low-key, in a good way. Fatigue. With HP I do not remember being as tired as I am with this pregnancy. I have been napping more often than I did with him. I napped almost every day from weeks six to twenty. Even now I am resting at least one or two days a week. Without the extra sleep, I feel drained. People say that I am more tired because I am chasing a toddler around, but I don't think that's it. Actually, I think that the whole "chasing a toddler around" line is one of those things people say because everyone says it, not because it's necessarily true. HP is a low-key kid. Yes, we get out every morning and do something around town, but it's not strenuous. We usually go to the park or the splash pad and I sit on the bench and chat with other moms while he does his thing. I think this pregnancy is just different. Sleep. I'm entering the phase where nighttime sleep is hard to come by. The wake-ups to use the bathroom don't bother me since I wake up for that even when I am not pregnant (though usually not multiple times a night). It's the inability to find a comfortable position that is compromising the quality of my sleep. 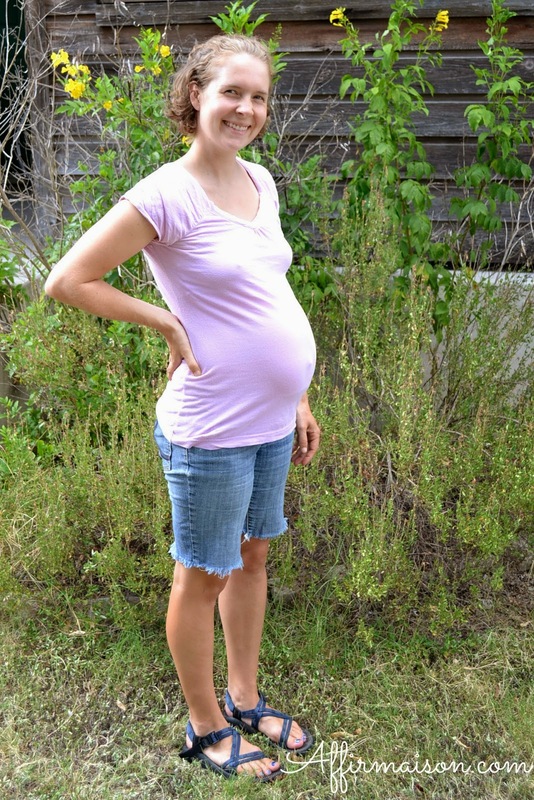 I am a stomach sleeper, which is challenging (read: nearly impossible) in the third trimester. Sleeping on my side hurts my right hip and I hate back sleeping. So far the hip pain hasn't been too extreme, but I remember how intense it was with HP near the end--not looking forward to that. I am also having trouble turning my brain off in the middle of the night, even when I am exhausted. All of that combined has meant a lot of poor quality, interrupted sleep at night, hence the need to nap more during the day. Exercise. I have had to slow down much sooner this pregnancy than I did with HP. I don't go to the gym or have regular workouts, but I am active every day since we walk and bike everywhere. Lately even biking short distances leaves me exhausted and my legs feeling sore. The heat of the summer isn't helping things, but it is more than that. With HP, I biked long distances right up to the end, and he was born at the end of June. Though then I wasn't biking with another child, and having an almost thirty pound toddler on your handlebars is no joke. I am doing my best to listen to my body and not overdo it, but we still need to get around. Movement. Feeling the baby move is the highlight of this whole experience. This babe is not exceptionally active, but I love when I am able to stop and notice all of his/her kicks and jabs. The whole process is surreal. It's easy for me to forget that there is a real, live, person inside of my body, until said person decides to remind me. Mental preparation. I am not prepared to go into labor. At all. I need to do some work on that front, if for no other reason than it is a waste of my energy to dread something that just has to happen. As for the rapidly approaching reality that we will have another child in the house, I am excited. Nervous for the lack of sleep, but excited to meet this baby and have our family together on the outside. Three months or less. For the past month or so I have been on a mediocre book streak. Nothing terrible (though I did absolutely hate The Goldfinch--which represents a week of my reading life I will never get back), but at the end of every book I felt... unsatisfied. Just when I was getting discouraged, my hold for Brigid Schulte's Overwhelmed: Work, Love, and Play When No One Has the Time became available. I desperately needed a dose of good writing and critical thinking, and it delivered. It is easily the best non-fiction book I have read all year. The quality of the research and writing reminds me of Susan Cain's Quiet: The Power of Introverts in a World that Won't Stop Talking, which I have raved about before. Neil's going to read it next so we can discuss it both in general, and which aspects we would like to apply to our lives, marriage, and family. In addition to whatever books I pick up on my own, I am a member of two book clubs--one that meets locally and one that meets virtually. Provocative and bleak, “The People in the Trees” might leave readers conflicted. It is exhaustively inventive and almost defiant in its refusal to offer redemption or solace — but that is arguably one of its virtues. This is perhaps less a novel to love than to admire for its sheer audacity. I love that book club challenges me to read books like The People in the Trees that I would not otherwise pick up. I always leave our meetings feeling differently about the book then when I walked in. Sometimes I end up liking the book more, as was the case with Elizabeth Gilbert's The Signature of All Things, and other time I like it less, which happened with Maria Semple's Where'd You Go Bernadette? Either way, I come away with a deeper and more nuanced understanding of the book. And as always, please let me know if you are reading something excellent so I can read it, too. At the end of last month I took a five day trip to New Jersey to be in a high school friend's wedding. It was the second time I have been away from HP for more than a day, the first being a three-day trip to this same friend's engagement party last summer in New York. I thought it would feel more momentous to be gone for five days, but it felt ... well, normal. Like it was no big deal. I take that to be a good sign. I love all of the time I get to spend with HP, but I also love my time alone to rejuvenate. Most of the time, I find those moments of solitude in the down times of our day or on a weekend morning when HP and Neil go to the park without me, but I have to admit, it was refreshing to have multiple days in a row where I was not responsible for another human. This trip felt particularly luxurious as I got to spend two nights in a hotel room by myself (!). Both times I've taken a multiple-day trip away from HP people have asked, "Do you just miss him so much?" And of course I miss him. But mostly it just feels like I am living my life and I know he is living his. Being a parent does not define who I am as an individual. It was easy to enjoy my trip because I knew HP and Neil were having a good time together. Besides, they went camping with friends while I was gone, so I am fairly certain they were having as much fun as I was. When I arrived home after a long day of travel, HP was taking his bath. Did he jump up to hug me upon my arrival? Tell me how much he missed me? Cry out with joy? Nope. He said, "Takin' a bath. Washcloth (points to the washcloth). Mama wearing stripes." and then proceeded to name the colors of each of the cups lined up on the edge of the bath. And you know what? It made me happy that my return was such a non-event for him. I take it as a sign that he is a well-loved, well-adjusted little boy. I appreciated the break from our regular routine and enjoyed my time away, but I was glad to come back home to my little family when it was over. I think that is the perfect way to feel. Most weeks, I love the rhythm of our life. It's slow, it's simple, and we've all been in a good place. But last week was rough. I mentally struggled to maintain my calm, easygoing demeanor. If I had to pick a theme for the week, it would have been: Parenting is hard. HP decided to stop napping. He's doing fine with it; I am not. Neil is busy at work and coming home later than usual. Normally he is at the house well before dinner time, which allows me to cook in peace while they hang out. So relaxing. This week, we've been lucky if he makes it home for dinner. The Texas summer, which has been so mild and pleasant up until now, has begun in earnest. I always think I won't let the heat bother me, but it inevitably does. Our days used to have five distinct phases: morning hang out time (reading books, eating breakfast, independent playtime for HP, chores for me), morning activity (park, swimming, museum, playdate, etc. ), nap time (a blissful 2.5-3 hours! ), afternoon hang out time (more books and independent play), and after dinner hangout time (usually Neil and HP playing in his room). Now nap time has been replaced with "rest time", is much shorter, and the whole day feels out of whack. The new schedule suits HP just fine. He is on edge by the end of the night, but holds it together surprisingly well considering the lack of daytime sleep. It's not until we wash his hair and brush his teeth that the meltdowns start. Bonus: he is in bed by 6:30 or 6:45 on no-nap days and sleeps later in the mornings. So really, he's getting the same amount of sleep as before; he's just consolidating it at night instead of spreading it out to a nap. But it's still an adjustment. After mentally fighting the change, I am trying to embrace the new normal. I am not completely convinced that naps are a thing of the past. A few weeks ago it seemed he was dropping his nap, then just as suddenly he started napping every day again. He is cutting his top two-year molars, so I am crossing my fingers that is the reason for the change. But at this point, it feels like a long shot and that I need to let go, admit that trying to force a nap on him is more about me than it is about him, and follow his lead. I am a huge believer in young children needing a lot of sleep. I think there are far too many children who are not getting enough rest, either during the day or at night. I fully intended my child to be napping well into his fourth year of life. So of course, I would have the child who decides to drop his nap at age two. Parenting is nothing if not a crash course in humility. Using the morning time to accomplish tasks that I normally would have done during his nap time. Letting go of the expectation that I will have a long chunk in the afternoon to myself and accept that "rest time" is only an hour. Easier said than done. Keeping the house straightened. When the house is a mess, everything feels more overwhelming and frustrating. Update: HP is currently on a three-day streak of great naps, including taking one in the middle of me writing this post about him dropping his nap. Children are unpredictable. When we moved two months ago, we lost a significant amount of storage space. Our old house had four closets in the bedrooms, one linen closet, three medicine cabinets, an enclosed garage, and a shed. Our new house has two bedroom closets, and small enclosed front porch, and a small utility room out back. Needless to say, we had to pare down our possessions. We are not a family of hoarders. I would not go so far as to call us minimalist, but we have no problem parting with our stuff in the name of space and organization. Cross-country moves by car (one Honda Accord en route to Oregon) and train (ten boxes, two bikes, and four carry-ons leaving Oregon) have trained us to hold on to only what is absolutely necessary and to sell or give away the rest. Our new storage options (or lack there of) forced me to take a hard look at what we owned. While I was in the midst of our project I read about two other bloggers undertaking similar purges. I love the William Morris quote Kelsey references to "have nothing in your house that you do not know to be beautiful or believe to be useful." There was the craft bin of old t-shirts I one day planned to make into a quilt. After five years of hauling it from place to place, it was time to admit that it wasn't going to happen. I thought admitting that would feel like a failure, but it felt freeing. The t-shirts have since been donated, put back into my regular rotation, or cut up into rags. Then I confronted the box of physical pictures that has been with me since high school. I got rid of ninety percent of the photos, and am working on the way to organize the rest. That project took all of an hour and a half, but I had put it off for years. Neil is fully supportive of my organizational efforts, but is slightly less willing to part with things than I am. My philosophy is if we haven't used it in the last year, let's get rid of it. His philosophy is "it might come in handy at some point." I let go of the fact that I think he has far too many t-shirts and tools that will never be used, and worked on minimizing the the stuff that I could. And honestly, he's probably right that the tools will come in handy. The t-shirts, well, there is still an excess of those. Hours of sorting, a trip to Goodwill, and the passage of bulk trash day later, and we feel much lighter.